Description: This is one of 6 Little People animated video stories of the Little People family consisting of Dad, Mom, Brother Jimmy (orange body/brown hair), Sister Penny (green body/yellow hair), Lucky (dog) and Baby Sister (white baby with hat). This Video is not actually made by Fisher Price, but is licensed by them to New World Video, produced by Marvel Productions, Ltd. - A New World Company. The story tells about how the Little People family learn the true meaning of Christmas. Designed for children ages 2 to 6 years old. FPT5174 - Black 30 minute VHS (U.S. NTSC format) video titled "Christmas Fun". WFL: 07-AC-04-3-A. FPT5260 - White plastic video sleeve titled "Christmas Fun" to hold the FPT5174 "Christmas Fun" VHS video. The sleeve has a red cover with a picture of a small Christmas tree, Baby riding on a rocking horse, Penny holding a gift, and Jimmy petting his dog Lucky. The top of the cover is marked "Little People Video". WFL: 07-AC-04-3-B. *See "Variations" below. FPT19744 - Red cardboard video sleeve titled "Christmas Fun" to hold the FPT5174 "Christmas Fun" VHS video. The sleeve has a red cover with a picture of a small Christmas tree, Baby riding on a rocking horse, Penny holding a gift, and Jimmy petting his dog Lucky. The top of the cover is marked "Little People Video". FPT5164 - This video was sold both with and without a small paperback book titled "Christmas Fun Activity Book". 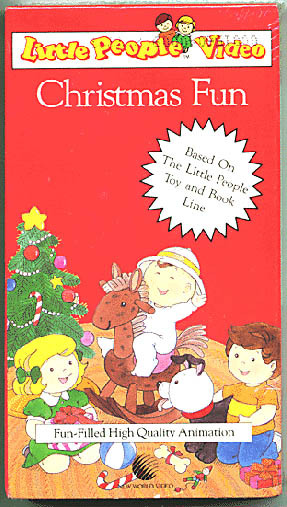 The book cover is red cover with a picture of a small Christmas tree, Baby riding on a rocking horse, Penny holding a gift, and Jimmy petting his dog Lucky. FPT5292 - Mint (unopened) Set with video and video case. FPT19616 - Mint (unopened) Set with video, video case, and activity book.